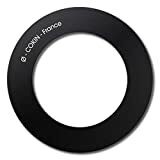 This Cokin 77mm Adapter Ring (with 0.75mm pitch thread) is specifically designed to attach Cokin’s Z-PRO series filter holder to lenses with a 77mm filter thread. This entry was posted in Discount Photography and tagged 77mm, Adapter, Cokin, TH0.75, Z477 by Ball Photo. Bookmark the permalink.